Kragenmoor is situated in the smaller region of Varanis, which consists of southwestern Stonefalls. The land surrounding Kragenmoor is largely rural, with practically no organized settlement like Kragenmoor, or other cities and towns. Private plantations and plots of farmland are found throughout the Kragenmoor area, as seen with the successful Sathram Plantation, or the Davenas Farm, which is found just across the main road from Kragenmoor. Speaking of the main road, it runs straight through Varanis, without anything in between, even Kragenmoor is found off the road. The only other organized settlement is the Iliath Temple, perhaps the largest temple in Stonefalls. This portion of Stonefalls is also inhabited by two known Ashlander tribes in Stonefalls, the Kagesh and the Ulath, who live closer towards the Iliath Temple and the Fungal Grotto. The most well-known landmark in Kragenmoor is the Tormented Spire, which looms over Varanis. Only the leader of Kragenmoor has access to the Tormented Spire. But overall, Kragenmoor is found in west-central Morrowind, alongside the Valus Mountains. This area of Morrowind is generally considered the territory of either House Hlaalu, or House Dres. [nb 1] Kragenmoor is neighbored by several settlements, including Karththor Dale in the north, Oaktown in the southeast, and Stonefalls in the northeast. Kragenmoor is built on a hill that overlooks the main road, nestled in a pocket around the Valus Mountains. But considering the poor quality of the land that the city is built on, Kragenmoor surrounds a stone foundation, which forms a circle that makes up the town square. The focal point of Kragenmoor is the Grandmaster's Palace, the seat of power that is found on the north side of the square and is seen overlooking the road. Kragenmoor is split into two districts, one is Upper Kragenmoor, which contains the Palace, as well as, various businesses like the local Fighters Guild and Mages Guild. These separate groups are found on hills that connect to the foundation through stone bridges. In the southern end of Kragenmoor is the Vanguard's Barrack, a traditional Dunmeri stronghold with a large tower. Somewhere in Kragenmoor is a private school dedicated to the Tribunal Temple. Then there is Lower Kragenmoor, where the slaves of House Dres and the less fortunate live in Kragenmoor. This portion of the city is connected to the main road. It is essentially a ravine that revolves around the ground around the stone foundation. Another stone bridge that continues west of Kragenmoor's square, which leads into the House Dres Crypts. How Kragenmoor was founded, or when is unknown. But that general area of Dres territory has been their own since the 84th year of the Golden Peace. The House Dres Crypts in Kragenmoor were re-discovered by Khajiiti and Argonian slaves in the mid-First Era, after excavating into the Valus Mountains just west of town. At one point or the other, a cadet branch of House Dres, the Dreloth family had relocated from Vvardenfell to Kragenmoor a long time ago. 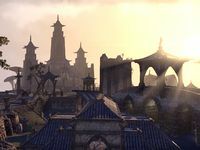 During the Skyrim Conquests, from 1E 240 to 1E 416, the mainland areas of Morrowind, including Kragenmoor, were conquered by the First Empire of the Nords. It was until much later towards the latter years of the occupation, the Dark Elves of the Ra'athim Clan that central Morrowind was liberated from the Nords. Under the command of King Kronin and his three sons, the Dark Elves utilized guerrilla warfare against the Nords and reclaimed the area. Yoriss, the aunt of Moraelyn, assumed the role as Queen of Kragenmoor following the re-occupation of Morrowind. During the Interregnum in 2E 582, the city-state of Kragenmoor was ruled by Grandmaster Omin Dres of House Dres. At the time, House Dres was allied with the Ebonheart Pact. At the same time, the Daggerfall Covenant had launched an attack onto Pact territory, from Bleakrock Isle, to the southern Inner Sea. The Covenant had taken the Coral Heart towards Fort Virak, where the Covenant would be defeated. Amidst the conflict, Garyn Indoril, the son of Tanval Indoril, was killed, bring severe grief towards the Indoril Grandmaster. In his rage, Tanval had taken the Coral Heart to Kragenmoor, where he would seek to enter the Tormented Spire. The Grandmaster had used Omin Dres' son as leverage to gain access to the Tormented Spire. Tanval had left his vanguard at Kragenmoor so that no one would follow, as he tries to summon Sadal, one of the Brothers of Strife. However, Sen Dres was rescued by an Agent of the Pact, and the alliance was given access to the Tormented Spire. In the late Second Era, Tiber Septim had attempted to conquer all of Tamriel in what had become known as the Tiber Wars, the city-states of both Blacklight and Kragenmoor, along with smaller settlements like Silgrad Tower and Cormaris View were at the forefront of defense against the rising Third Empire. As time went on, the defense against the Imperial Legion had dwindled as the Great Houses decided to fend for themselves, negotiate peace, or just remain neutral. In the end, only House Redoran fought against them, in failure, and the Imperial Province of Morrowind was formed. Kragenmoor had become a city of the Third Empire. During the Imperial Simulacrum in the late Third Era, the city-state of Kragenmoor was an active settlement, being ruled by King Shalpar. It had a rivalry with Ebonheart. ^ Kragenmoor's house affiliation has teetered between House Hlaalu and House Dres through various sources. In a concept map of Morrowind and Caius Cosade's Letter, there are references to House Hlaalu in Kragenmoor, with the latter being an indirect example. All the while, House Dres would become the leaders of both Kragenmoor and Ebonheart in ESO. It was later retconned in the Understanding House Dres lorebook that House Dres had territory in central Morrowind, as well as, southeast Morrowind.